Share photos and video while keeping your content rights. Our terms are clear: we only ask rights to help you broadcast your content to who you want. keep your event private for 100% of confidentiality: inaccessible to web crawlers like Google, Yahoo even our own sharypic search won't find it (unless you had been invited or you are the event owner). You are in charge to share your event with your relative. open your event to the world by using a public events. Anyone will be able to find your event on internet, including Google, Yahoo and all other search engines. keep your event public but add a password. It will be easy to find, but only the one in possession of the password will be able to access your photos and videos. Photos are for private and non commercial use. For any other use, please contact the author and/or the service (Twitter/Instagram...). We are an advertising free photo service. We won't sell your data to other organizations. 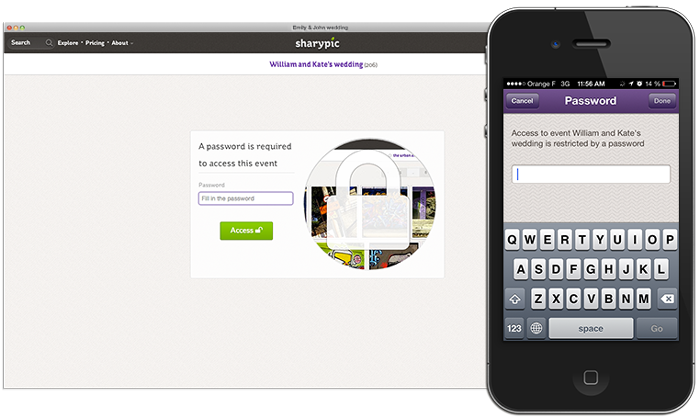 All your communications with Sharypic are protected by HTTPS. Sharypic does not own your content.